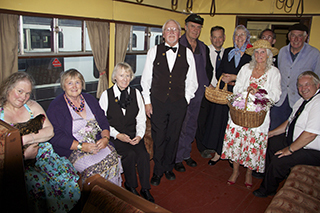 On Saturday 17 May the SDR Trust Museum took part for the first time in the national Museums at Night event. 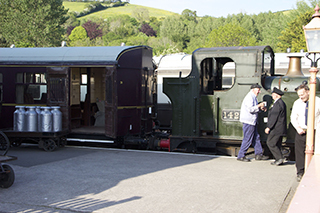 This featured a guided tour of the museum and station platform at Buckfastleigh, starting at 7.30pm in the evening. Visitors first went into the Light Side, where Ashley's driver, looking remarkably like Colin Harmes, told them about the workings of a steam engine and the goings-on in Exeter Gas Works. Moving onward the group came to broad gauge survivor Tiny, which started its working life shunting at Sutton Harbour in Plymouth. Tiny's driver turned out to be Dave Knowling's Great Great Grandfather, and looks remarkably like his Great Great Grandson. Dave told an amazing story of his upbringing and education in Merrivale, working his way to Plymouth on the Plymouth & Dartmoor tramway, his first visit to a Plymouth inn, and eventually becoming Tony's driver. 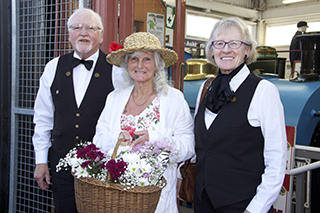 On to the Dark Side, where Chief Steward Bill Parratt was preparing to go on duty on the restaurant car of the up London express, assisted by one of the female staff from the refreshment rooms - actually Sue Parratt. They made good use of the museum's fine collection of tableware. 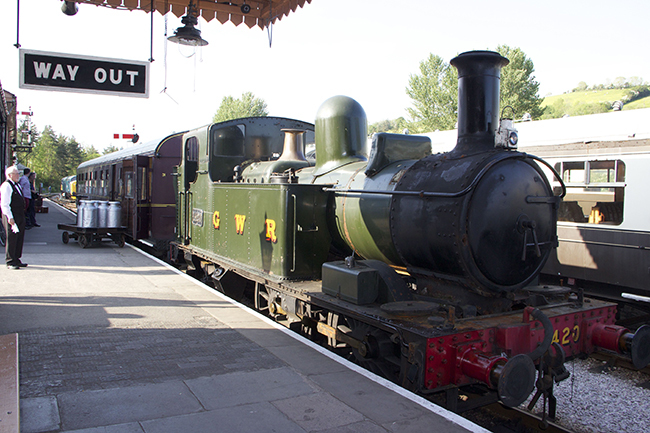 On reaching the platform, visitors found that the Ashburton train was waiting for them, formed as usual of 0-4-2T No 1420 and auto coach No 228. 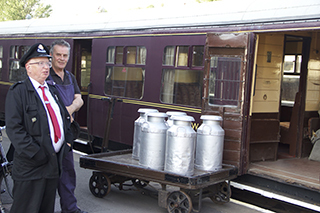 While porter Gordon Hall got on with loading some milk churns, Guard John Keohane explained his duties, and pointed out that he was in charge of the train, and not the driver. Fireman Harmes and Driver Knowling were on hand to go through the intricacies of auto working, and visitors were able to go into the driving cab of the coach and try the controls - the warning gong was the favourite! Departure time being imminent the party boarded the train, where the passengers all had stories to tell. Carole Pluckrose had brought her three prize hens which she was taking to show in Ashburton, while Wendy Brodribb was knitting a scarf for her son, recently-enlisted in the armed forces. 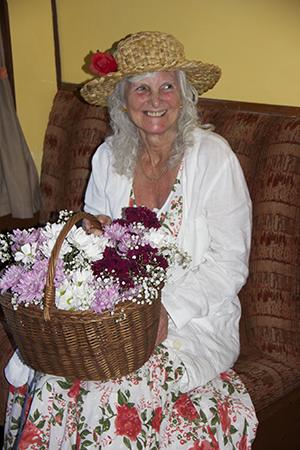 Barbara Parratt, a flower seller, was taking a basket of posies to market in Ashburton. Stephen Pluckrose was doing his best to read the latest Picture Post, but was finding it difficult with all the gossip around him.